Isn’t it time you lived with more: joy, passion, and purpose? Are you ready to finally answer the questions, Who am I, Why am I here, and What am I supposed to be doing with my life? Discover Your Miracle Life is a transformational experience, where remarkable people share a journey of self-discovery and personal development. Are you tired of feeling no matter what you do nothing works? Do you feel you don't know who you are or where to start? Or are you looking for real meaning in your life? Do you feel lost and all alone, even in a crowd? Or do you wish life could be more about you instead of always about someone else? No matter how successful you are, do you think there's always something more out there for you? Does it feel like there’s a lack of meaning and fulfillment in your life? Is there an urge within you to find a community of like-minded purpose-driven people? When I was five years old, I had dreams of flying planes and making people feel happy, loved, and included. Instead of following my dreams, I listened to the words of parents and other adults who were encouraging me to be realistic. My grandfather wanted me to toughen up, compete with everyone, and take no prisoners. No matter what I did, or accomplished, it was never good enough for him. It wasn’t long before I stopped competing with others, and started competing with myself. I earned my bachelor's degree, master’s degree, and eventually became an Air Force pilot. After my time in the service, I became a pilot for a major airline company. My life, to others, seemed perfect. I had a big house in the Colorado mountains, beautiful wife, great paying job, but there was always something missing. I was doing everything I was taught I was supposed to do, ever since I was a child. But I finally had to wake up when I had three life changing events. My first “crisis awakening” was when I lost a friend, and fellow pilot on 9/11. The second, was having experienced a major financial loss, due to my employer declaring bankruptcy. And the most devastating crisis awakening was when my wife, of 21 years, wanted a divorce. It’s been 35 years since I started researching and developing personal growth programs. I’m now free to live the life I was born and destined to live. No longer do I feel like something is missing, instead I now have meaning, passion and joy in my life. After finding my answers to what was missing in my life, I’ve perfected the formula and have shared it with many people also searching for a better version of themselves. And I’d like to share it with you. Don't miss out sign up now! Discover your unique purpose, so that you can fuel the passion and meaning that only belongs to you. Understand what your gifts and talents bring to the world, and find greater insight into the difference you are meant to make. Realize the true meaning behind your wake-up calls and challenges, and stop struggling with the feelings of emptiness, and frustration. Create your personal game plan for aligning your life with your newfound purpose. Six modules of training that are easy to get started and use now. Lessons that are simple to integrate into your daily life. Community Facebook group so that you can be supported with a community of like-minded purpose driven people. Guided meditations to find the answers, within yourself, to finding clarity in what you want in life. Firsthand exercises to integrate the material as you move into a powerful new direction in your life. We call these exercises Conscious Discovery Experiential Exercises. Reserve your spot now, you don't want to miss out on this life changing opportunity. Founded in 2007 with the intent to help people create a life of happiness, health and abundance. We co-founded Imagine Miracles to inspire people to get to know themselves & live an empowered life of their design. We are able to share our mission through live speaking events, webinars, seminars, workshops, videos, DVDs, CDs, and podcasts. Vince has 35 years of researching and developing personal growth programs. He is known as a public speaker, trainer, author, presenter, and transformation coach. There mission is to help others find success and happiness by living a life of their own design. Likewise, Vince developed specific methodologies to produce breakthrough results in self-discovery and self empowerment. They were trained and mentored by some of the biggest names in the transformation and personal growth industry. The list includes but is not limited to Jack Canfield, Debbie Ford, John Maxwell, and Joe Dispenza. Not only is Mary co-founder of Imagine Miracles, but she is also the founder of the Sophia Retreat Center. The Sophia Retreat Center provides a safe, secluded, and supportive space for their workshops, seminars and personal one-on-one retreats. I'm Ready for Vince and Mary Now! What if I tried other programs, but nothing works? There isn’t a one-size-fits-all program, and most programs teach you how to do something the teacher’s way. Discover Your Miracle Life is designed to take the uniqueness of the human experience in consideration, and transform your life into the one you dream about. Vince takes his 35+ years of experience in experiential education, training, and coaching, in which he strategically developed materials to help you learn and discover in the way you are designed. What if I don’t have the time to do the program? We’ve made the process simple to integrate in your daily life. Classes are recorded, and you have 24 hour access, to accommodate your schedule. Feel free to study at your own pace, because you have lifetime access to the material. We have a dedicated community where you can share, ask, answer, and communicate. You are not alone, as a community is here to help you along the way with ideas and encouragement. With a better version of yourself waiting for you, can you afford not to invest in yourself? Many people have dreams about what it would be like to feel happy, and live an abundant life. Also I know many people dreaming about losing weight, making money, and finding love. The problem is that happiness, health, and abundance must be found on the inside first, before you can attract these things in your life. How can I get in touch with Vince or Mary, if I have other questions? Contact us here, and we’ll be happy to answer any of your questions. Enroll Now to Discover Your Unique Purpose and Live Your Life Your Way! Take the first step to joining us in living a miracle life. Tap into the ”life you are meant to live.” Immerse yourself into a community of like-minded people sharing a journey in personal development. Admission to the Discover Your Miracle Life Virtual Training is $2997 and will be an experience of self-discovery. 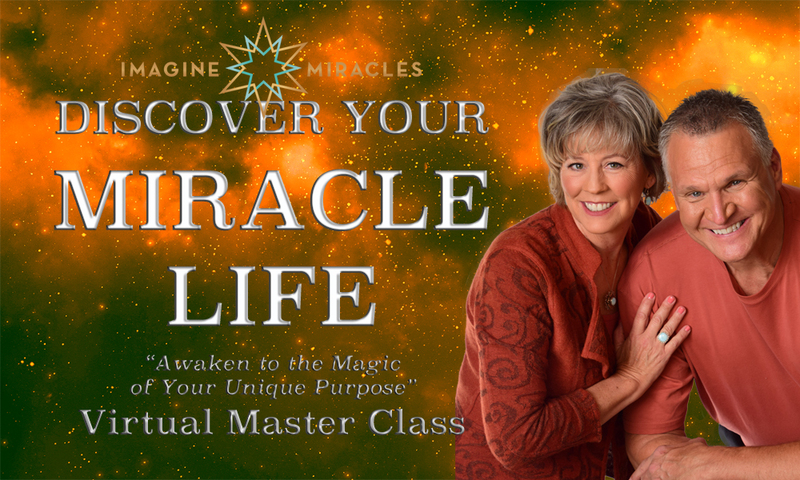 Are you ready to DISCOVER YOUR MIRACLE LIFE? Just use the promo code MYMIRACLE and you will get $1000 off of the the normal $2997 price. That is a 33% savings if you act now. This offer is for a limited time don't delay!